2010 Birding Goals coming tomorrow! On Monday, December 14th, I watched with delight as my backyard birds took advantage of the warm water birdbath. It was so fun to watch and I wanted to share that moment with someone...anyone, but I was all alone. I tried to capture what I felt and thought by putting it into the rigourous poetic form of the sonnet. Enjoy! A white quilt of snow covering the ground. Freshly filled birdbath with water so warm. Sparrows and Finches and Juncos abound. Drinking first, the chief finch, as is the norm. Up he hops…sips…hops left…then sips again. Each satisfying sip, downed with pleasure. Wings a-flickin’, rump waggin’, droplets flung. A thorough drenching of his crimson face. Up for some sun…his bathing song is sung. The young white-crown anxious to take his place. In it springs, splashing water everywhere. With such a scene erasing every care. Jay Carlisle's little lesson to me at the Deer Flat CBC on the difference between Merlins and Sharpies caused me to look longer and harder at a little guy we had in the cottonwood tree near the Avimor entry this afternoon. I would probably has simply passed it off as Sharp-shinned Hawk normally, but I took the time to draw it so it would force me to look at the field marks more closely. Here is my field drawing and the relative proportions of the head and tail feel pretty good. The only problem is, I still can't determine if it is a Sharpie or a Merlin. I did not get any looks at the wings, back, or in flight and unfortunately it disappeared while I had my head down drawing it. Looking in my field guides...the rounded tail looks good for a Taiga Merlin from Peterson's and the distinct eye brow and weak mustache support it. Because it was using a tall tree to hunt from also leads me away from Sharpie as I usually happen upon Sharpies in medium sized lower bushes. The broad white tail tip being rounded could also indicate Coopers, but the overall size was so small that I have a hard time with that. UPDATE: On my way from my day job to my evening job I saw that the bird was back in the tall cottonwood and I had better views while it munched on what appeared to be a Junco. As it bent down to pluck meat and feathers I could see that the wings extended to about the same length as the tail or short of it and crossed in the back a bit. It was pretty uniformly dark on the wings and back. The light was better too and I was able to see the face with more clarity. All this combined with my afternoon study of Merlins vs. Sharpies and another call to Jay helped me to confirm that it is indeed a Merlin. Avimor's 100th bird recorded as seen! 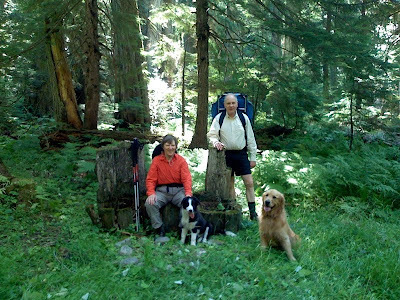 After college and marriage, my husband Keith and I spent a lot of time hiking, fishing and exploring the mountains and forests of North Idaho. I became interested in knowing the names of the trees, bushes and flowers and this soon led to an interest to birds. Birds soon became my main focus. I joined the Spokane Audubon Society and started participating in their field trips. You ask when? I have a note in my life list book that says, "Life list started Christmas of 1965 when I received a "Peterson's Field Guide to Western Birds" for Christmas from my husband". Over the years, I have done a lot of "just birding" trips. Today, except for Christmas Bird Counts, checking our Audubon chapters bluebird trails, once a month birding Mica Bay on Coeur d'Alene Lake (our Audubon Chapter has adopted this bay as part of the Idaho Fish and Game "Adopt a Wetland" program) and an occasional Audubon Chapter fieldtrip, I do very little "just birding" trips. I prefer to combine birding with hiking, bicycle touring and other activities. Idaho: "Trail of the Coeur d'Alenes". This is a 70 mile bike trail (Rails to Trails) from Plummer to Mullen. It goes through a part of Heyburn State Park, along Coeur d'Alene Lake to Harrison and then follows the Coeur d'Alene River drainage to Mullan. It goes by several small lakes and wetlands including the Schlepp Farm, where work has been underway by Ducks Unlimited and partners to restore wetland and riparian habitat. United States: Central Park in New York City. My daughter attended Columbia University in New York City for 8 years. I visited her every spring and fall. Central Park became my birding playground. I became acquainted with several New York birders, including Marie Winn who wrote "Red-tails in Love". It is the story of a pair of Red-tailed Hawks that hunt, court, mate and raise young in a nest on a ledge of a Fifth Avenue building three floors above Mary Tyler Moore's apartment and across the street from Wood Allen's. I visited the nest site several times. Probably more of a watcher than a lister. I am not very good at keeping lists. I keep a life list, state list and yard list but I couldn't tell you the numbers without looking them up. I've tried keeping a yearly list but lose track after the first couple of months. Dr. Stephen Lindsay did a Big Year in 2001. He attempted to see 200 birds in Kootenai County during the year 2001. He tallied up only 199 and on January 1, 2002 he found a Snowy Owl out on Rathdrum Prairie which would have made 200 if he had seen it the day before. This inspired me to do a Kootenai County Big Year but I knew I wasn't dedicated enough to be in the field that much plus the fact that my hearing is not what it used to be. I asked my fellow birders in our Audubon Chapter to join me in a group Kootenai County Big year in 2002. This turned out to be a lot of fun for everyone. It soon came to be a challenge to see who could see the first bird of the season. In 2002, we as group came up with 195 species, four short of what Steve had done on his own. However, in 2004 we managed to come up with 207. I was reporting our results on Inland-nw-birders and IBLE and the idea of doing group County Big Years caught on. In 2005, twenty-two counties tallied Big Years, and this year, the total number of participating Idaho counties has reached thirty (out of forty-four). The current and historical results are posted on IdahoBirds.net. Lew Ulrey does a fantastic job of pulling all of the Idaho county lists together. Birders from outside Idaho began to take note of the county tallies. Washington state started to collate group county Big Years in 2007. One of the benefits of collating the county lists on a state-wide basis is the ability to track arrival dates across the region. Of course, not all the dates are arrival dates, especially for uncommon species, but the data bring the migration timing into clearer focus. When I first stated birding, I kept track of what I was seeing in a small field notebook, of which I now have many. Tom Rogers, my mentor and at that time regional editor for "American Birds Field Notes ", gave me all the Idaho sightings he had collected as editor. He had them in a notebook, a page for each species. I copied all the records from my field notebooks onto these pages and it soon became five notebooks. When we got our first computer, my husband Keith suggested we transfer all these sightings into a database. He created a database format with fields such as name, date, number, observer, location, county, latilong, notes, spring arrival, lifelist etc.. With Keith's help, we added not only all my sighting but other birders sighting. 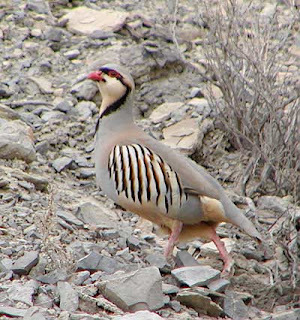 We added sightings from fellow area birders, all the CBC and BBS records, Idaho Fish and Game surveys, and sightings listed in the "American Birds Field Notes". "Bird Notes", a newsletter of the Canyon Birds from the Lewiston area, and "Prairie Owl", newsletter of the Palouse Audubon Society, both list monthly sightings from their area. Those sighting were added to the database. I concentrated mostly on North Idaho. Over the years, we added all the historic bird sightings listed in Thomas Burleigh's book "Birds of Idaho". Lisa Hardy, who has been helping me, just added collected specimens from the Conner Museum at WSU. This database served as a stimulus for the Development of the Idaho Bird Distribution Database and to the publication of the book "Idaho Bird Distribution: Mapping By Latilong" by Daniel A. Stephens and Shirley Horning Sturts (1st edition 1991, 2nd edition 1997). Stacy Peterson and I put the maps on the Idaho birding website, IdahoBirds.net in 2006. The latilong maps are a work in progress. I have corrected and updated the maps to compare with records in the database. I'm presently collecting breeding and overwintering records from Idaho birders to further update the maps so they will eventually reflect the true status of bird species found in each latilong. We now have about 190,000 bird records in this database. With the rate birds are being reported today on IBLE and Inland-n w-birders and now eBird, I no longer add many birds to the database, not even my own. Most of the birds I do add are either ones that are status changes for the distribution maps that you can see on http://www.idahobirds.net/distribution/dist_index.html or rare bird reports that are sent to the Idaho Bird Records Committee http://www.idahobirds.net/ibrc/ibrc.html . I plan to report more lists to eBird but so far I'm reporting only Mica Bay survey (an informal survey) results. 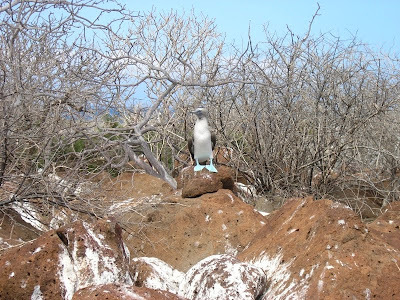 My favorite bird of all time is the Blue-footed Booby which I saw on a trip to the Galapagos. It was a trip I took in January 2007 with a local travel company in Coeur d'Alene called ROW. There were 12 us on the trip, including my daughter from Seattle and several of my good friends from Coeur d'Alene. ROW is the only touring company that has permission to camp on the Island. We camped in tents on the beach at two different locations and stayed at a hotel on Isabela Island It was not a "just birding" trip. 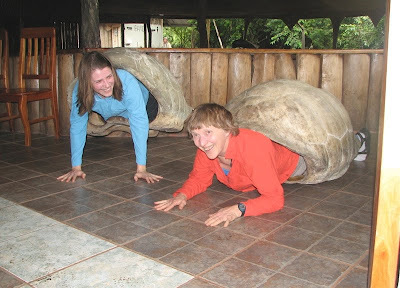 We went sea kayaking, snorkeling with baby sea lions and sharks, viewed the famous tortoises and iguanas, hiked up to a volcano on Isabela Island. It was a real adventure and as my daughter said: "the trip of a lifetime". There were many other neat birds on this trip including the famous Darwin finches, but the Blue-footed Booby was my favorite. There are two other sightings I might mention that ,when I was just getting into birding, made an impression on me. My husband and I taught in an overseas dependent school on a military base in Verdun, France 1965-1966. On May 28, 1966 we visited Texel Island, a birding preserve in the Netherlands , where we saw an albino Oystercatcher. Another Oystercatcher was in an aerial duel with a Herring Gull. Our guide said their nests were too close together and the Herring would probably end up eating the young in the nest of the Oystercatcher. On June 19, 1967, while driving through Saskatchewan on the Trans Canada Highway, I saw my first American Avocet and almost jumped out the car in excitement. We turned around for a better look. It has been a favorite bird of mind ever since. Sibley has more illustrations. Peterson has good written descriptions and arrows that draw your attention to important field marks. I also like the illustrations in National Geographic and it is easier to take in the field than Sibley. I have quite a large library of bird books. The following is a sample. I have a minor in Zoology but I didn't take any classes in ornithology. I took the Cornell Laboratory Home Study Course several years ago. I've been thinking of doing weekly birding of my home area - Fernan Lake and Creek and report my findings on eBird. I'm newsletter editor and webmaster for our local Audubon Chapter. I'm secretary of the Idaho Bird Records Committee. I compile the Coeur d'Alene and Spirit Lake CBCs. I used to do two BBS routes but I know longer can hear well enough to do them. I participate in the Thanksgiving Day Count. I do the Feeder Watch for Cornell Laboratory of Ornithology. I'm a retired school teacher and librarian from Post Falls School District. My husband and I celebrated our 51st Anniversary this past June. We have two children. Our daughter, Carrie, is a professor at the University of Washington in the Department of Construction Management. Her husband Steve is a computer engineer with a company making software for cell phones. Carrie gave birth to twins (boy -girl) in July of this year. I'm looking forward to teaching them about birds when they get older. Our son, Kim, is a sous-chef at a high-end vegetarian restaurant called Carmelita in Seattle. His wife Karen is a photographer specializing in sports photography, specializing in mountain biking and snowboarding. I'm the only birder in the family but my husband and children have a love of nature and appreciate birds and other wildlife. Carrie has bird feeders in the backyard. 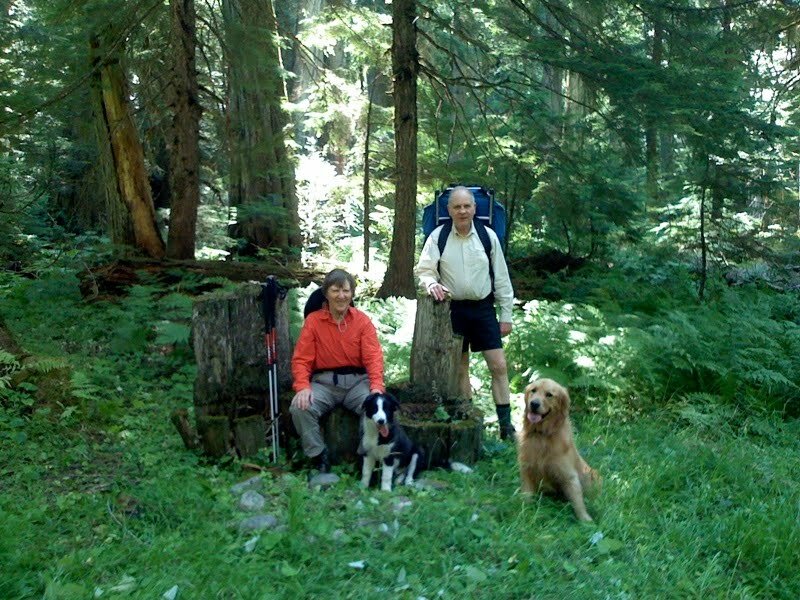 We all enjoy a variety of outdoor activities including bicycle touring, hiking, backpacking, skiing (downhill and cross country), sprint triathlons (Carrie and I) and mountain biking (Kim and Karen) . (not so funny at the time but we laugh about it now) A couple of years ago my husband, daughter and I were doing day hikes on the east side of the Sierra Mountains in California. I saw a notice about volunteers needed to do a bird survey of Mono Lake. Carrie and I volunteered. We were assigned a section of the north shore with another birder from the Bay Area. We left our car at a county park and the three of us were dropped off a few miles east of the park. Our assignment was to walk the shoreline back to the county park. We were to meet back at a restaurant in Lee Vining around 4:00 p.m. for pizza and to turn in our bird list. No one warned us about the quicksand and bog near the county park. I got the impression they didn't know. The day went well until we approached the county park. By that time we were really tired and looking forward the promised pizza. Then things became a little difficult and scary. Two small creeks flow into the lake right before you get the county park. They are small and one can easily jump over them. However, getting across safely is deceptive. We discovered quicksand when Carrie suddenly found herself sunk in sand up to and over her knees. It was not the kind you see in movies where one slowly sinks out of sight, that was a good thing. She sat back and was able to pull herself out with my help. Then the gal that was with us did the same thing. I was lucky and made it across without going in. At this point, we thought it wise to hike out to the road. However, that didn't prove to be an option either. There was a tangle of vegetation with strange limestone tufa towers interspersed between us and where we thought the road was. We followed what looked like a deer trail into the vegetation and spent the next half hour or so wandering around from one dead end trail to another and climbing up on one or two of tufa towers to get our bearings. Eventually we ended back on the beach facing another stream crossing. This turned out to be repeat of our first crossing. First Carrie went in and then our birding friend sunk into to sand much further than before. I must live right, I was spared again. We were encouraged when we could see the boardwalk not to far off but to get there we had another hazard to deal with, a bog. We gingerly walked across the bog ready to help each other if one us broke through. We looked pretty bedraggled as we climbed onto boardwalk, receiving some strange looks from a couple of visitors. There were several signs around warning people to stay on the boardwalk and other signs saying to stay off the tufa towers. By the time we cleaned ourselves up it was 6:00 p.m. . The bird survey organizers were just leaving the restaurant when we arrived. We were glad they had a few pieces of pizza left, which we soon devoured. They had called our motel and reported us missing, My husband and the motel managers were relieved when we called in. p.s. This was before we carried cell phones. On the way home from one of our Spirit Lake CBCs, we pulled into a busy gas station and convienence store to use the facilities. We were still in the CBC circle. It was dusk and as we pulled into the parking lot we immediately saw a Pygmy Owl sitting in this little tree right next to building. It was rather amazing that all the other customers coming a going didn't see it. The little owl was still there when we left, he didn't seem to be at disturbed with all the coming and going of people and cars. This was the book that Bill Thompson III sent me for winning his blog caption contest in November. It was autographed by editor Lisa White and by Bill on the chapter he authored. This is now a keepsake book, so it will not be passed along to prize winners from my blog contests. This is a book that will be enjoyed by every birder. I read this book in three days. 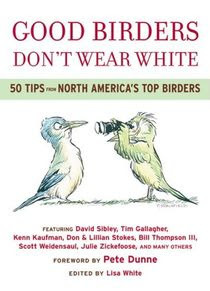 It has essays from 50 of the best and well known birders. I laughed a lot as I read it as it captures some of the goofy nature of birders and birds. Tons of great tips were given to birders of all levels, from backyard birders, to tour participants, to bird photographers. It felt like reading 50 fantastic magazine articles about birding. I'm not going to get into details about all the different essays, just go out and buy it for yourself or for your birdwatching friends! This is yet again a reference to birds...some beautiful and delicious birds at that. Ring-neck Pheasants. 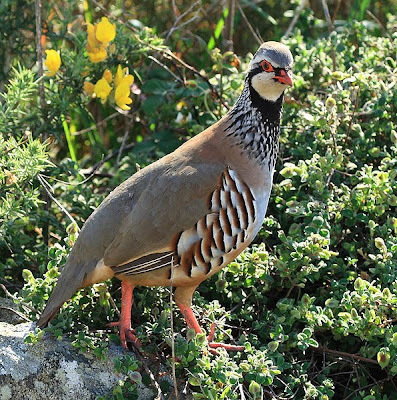 Pheasants are native to Asia and were brought to Europe sometime around the time of Alexander the Great and they became very popular game birds. They seem to do pretty well in most environments they are introduced to and can be found across most of the nothern United States. They seem to avoid regions like Arizona and the most of the southern states, probably due to heat and humidity. I had a fascinating honors History of Western Civilization class in college that focused on "Rhetoric" and even though I took the course as a very underqualified freshman, its impact on me has been lasting. The professor, Dr. Gideon Burton, commented once that languages eventually climax and then deteriorate until they become new languages. My personal opinion is that the English language was at is best in the period between 1770 to 1850 and has since commenced its decline. Today I experienced my first ever Christmas Bird Count and it was a blast! It was a fun atmosphere as 20 plus birders gathered at the Deer Flat Refuge Headquarters. I got to meet some of the local birders that I have seen post to IBLE. There was a lot of excitment and energy and good natured folks ready to brave the cold and see lots of birds. My face is still sore from smiling all day! Lynn Davenport and I were privileged to accompany Jay Carlisle and Heidi Ware, which for me turned out to be a day-long seminar as I observed some amazing birding skills as well as some awesome birds. Jay can identify pretty much every bird by sound and by the way it flys. I was blown away at his ability to ID those birds time and time again. Heidi also has an amazing gift for ID'ing birds by sound which came in very handy throughout the day. I wish I could have contributed more to the group, but I sure had fun and learned a lot. It felt a lot like when I play in a golf tournament when you play a best-ball scramble, I might get in just one or two shots that the group uses. Anyway, our group tallied 60 species today in our assigned zone. Our 15 mile diameter count area tallied 90 total species. Pretty darn good for a cold winter day in Idaho! 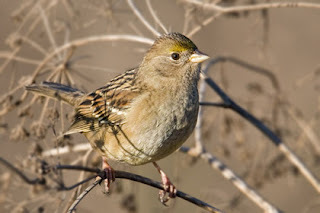 The bird of the day for all of us was the Golden-crowned Sparrow! This sparrow is normally found on the west coast of the United States. It was one of the first birds we saw at our first stop of the morning at the Caldwell Ponds. It is my life bird #317 too! I was also able to add some new birds to my Idaho list, like the Marsh Wren and Merlin which is always nice. The pair of Cackling Geese were particularly cool to see and have positively identified with qualified people around. I'm always happy to see Red-breasted Nuthatches, Brown Creepers, and Golden-crowned Kinglets, so it was just a great day! Oh, I almost forgot the four Least Sandpipers! I also want to report on our use of tips discussed on BirdFellow. We did indeed "pish our lips off." Jay was particularly effective at this. It was really neat to see a bush with a bird or two in it and when Jay pished a dozen more would pop up. Jay can also generate some pretty sweet Northern Pygmy Owl and Western Screech Owl calls. I used BirdJam to try and detect the presence of a few uncooperative species, but about the only good it did today was get the Hermit Thrush to call back to confirm what Jay and Heidi had already heard. We did scan into the distance and looked up a lot. By so doing, I learned some great waterfowl and blackbird in flight ID tips. 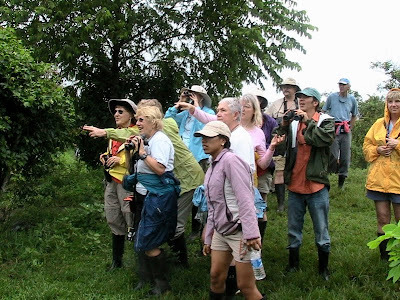 Looking at flocks of common birds (in our case White-Crowned Sparrows) in combination with pishing is how we observed the Golden-crowned Sparrow. Looking into flocks of Starlings and Red-winged Blackbirds we also observed Brewer's Blackbirds. My only regret of the day is that I didn't take the whole day off of work so I could join the group as they gathered to go over the day's list and enjoy a nice potluck meal. I really love birds, religion, history, eating food, symbology and etymology and the well known Christmas carol "The Twelve Days of Christmas" has all of that. The birds mentioned in this centuries old tune have had attached to them all kinds of symbolism, from Christian to pagan fertility rituals, from simple romantic gifts of love to the rudimentary and basic food sources. Top of my woodpecker priority list is the Pileated Woodpecker! I recall seeing one as a Boy Scout at a camp near Cascade, but that was pre-birder and is therefore not on my eBird life list. This eBird map shows Pileated Woodpecker sightings from 2005 through 2009. It looks like northern Idaho would be the place to have the best odds of seeing a Pileated. They have been seen as close to where I live as the Idaho Bird Observatory as well as the forest roads in Boise County. The Cascade area is another possibility. I've learned that a mating pair will hold its territory year round, so going where they have been seen before increases my chances. I read that they also that they prefer large and dead trees to excavate. This gives me an a better idea of the habitat I should be looking in. I should look for large rectangular or oblong excavations in the timber for signs of feeding or nesting. Does anyone know if Pileated Woodpeckers respond to playing their calls? It looks like they might based on a study I saw for Vancouver Island. 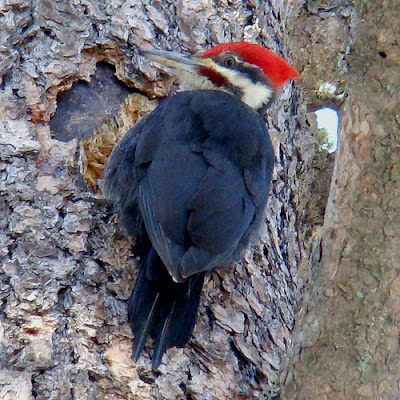 Do you have a surefire location to see Pileated Woodpeckers? The first Lewis's Woodpecker I ever saw was at the Oak Flat Campground outside of Superior, AZ on Nov 22nd, 2006. Since then I have seen them here at Avimor as well as four other Idaho birding hotspots. Their color pattern and flight are distinct among the Picidaes. With their large wings, they seem to soar across the tree tops rather than showing the trademark undulating flight style common to most other woodpecker species. It is also fun to watch them flycatching from a tall snag. Marion Paton's yard in Patagonia, AZ was the first place I saw an Acorn Woodpecker. I also saw them at Ash Canyon Bed & Breakfast and the Tonto Fish Hatchery, both in Arizona. Don't you just love that face?! Its like a panda crossed with a woodpecker with a little clown thrown in. At Ash Canyon I had them within feet of me as they fed at feeders. 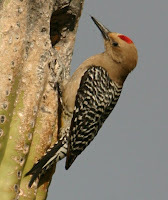 While I lived in Arizona, I saw Gila Woodpeckers 54 times, per my eBird records. Most often it was at recreation areas along the Salt River near Mesa, AZ or at the Desert Botanical Garden in Phoenix where I often spent my lunch breaks birdwatching. This is one cool bird that would visit my backyard too. The red thumb print on top of the head is unique and indicates a male. My first Red-naped Sapsucker was observed at Boyce Thompson Arboretum in Arizona. Since then I have seen them in Idaho, Oregon, and Utah. The Ladder-backed Woodpecker was an occasional treat to see down in Arizona. The first one I ever saw was at the Desert Botanical Garden in Phoenix. 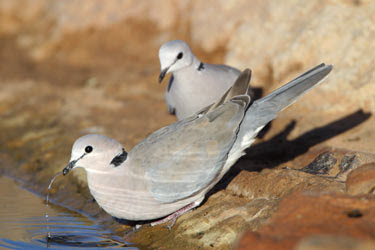 I vividly recall a couple encounters with them at recreation areas along the Salt River. And my eBird record shows that I saw one at Ash Canyon Bed & Breakfast too. Next to the Northern Flicker, the Downy Woodpecker is the species I see most frequently. They are super cute little things. I recall seeing my first one on a walk with my father-in-law at Deer Flat Wildlife Refuge. It was feeding on a stalk of hairy mullen right on the edge of the trail. It let us get to within a couple feet of it where we observed it very closely for a long long time. 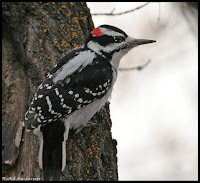 Surprisingly, all of my sightings of Downy Woodpeckers have been in Idaho. I never did see one in Arizona and my birding in other states has been pretty limited. 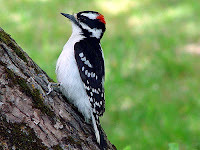 The Hairy Woodpecker has a special place for me as the first bird on my life list. 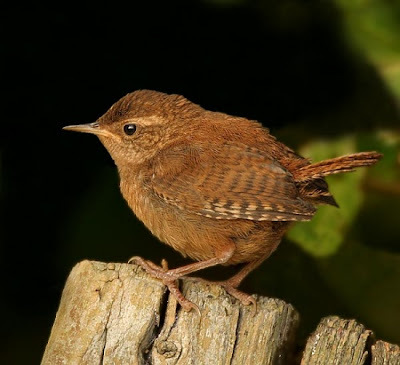 Oh, it wasn't the first bird I ever saw as an official birdwatcher, but it is the first bird on my eBird life list because it was the first written record I kept after I had gotten myself my first Sibley's field guide. When I finally started using eBird it became the first official record of my sighting on September 18th, 2004. At the time I was the leader of a few 11-year-old Boy Scouts and we were on a campout at the Christopher Creek Campground off of Highway 260 in Arizona. I currently only have five sightings of a Hairy Woodpecker, two in AZ, two in ID, and one in Oregon. Ash Canyon Bed & Breakfast down there close to the Mexican border is the only place I have seen the Arizona Woodpecker, a pair of them actually. My only sighting of the White-headed Woodpecker was in my campsite on a trip to Malhuer this last summer. Idlewild Campground is a great spot in the Malhuer National Forest to include on your trips to the Malhuer National Wildlife Refuge. 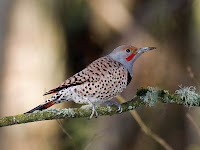 I currently have more than 200 eBird recorded sightings of the Northern Flicker. I have probably seen them at least double that without recording them because I wasn't officially birding at the time. My sightings come from ID, AZ, OR, and UT. I get them at my platform feeder almost every day. I've observed them nesting in tree cavities and fighting with Kestrels and Starlings over such nesting holes. I have only seen the Red-Shafted subspecies, so I look forward to seeing Yellow-shafted at a future date. 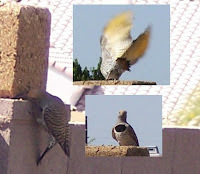 I have seven eBird recorded sightings of the Gilded Flicker, but I see that I posted the photo above to birdforum in April of 2005, so that was probably my first official sighting before I discovered eBird. I recall seeing them a couple of times at my seed block in Mesa. All of of my other sightings were at the Desert Botanical Garden in Phoenix, Arizona. 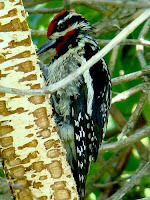 A future post will be of my Woodpecker Wish List and where I could possibly see them in Idaho in 2010!